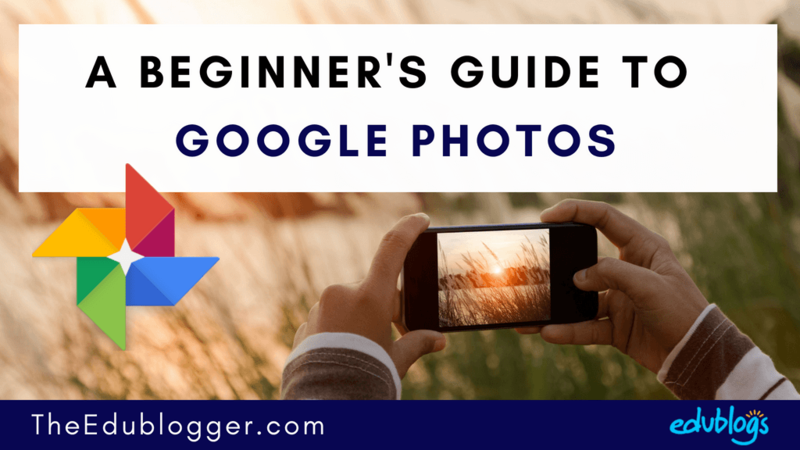 A Beginner's Guide To Google Photos -- Store, organize, and share your photos for free! If you’re anything like me, you’re taking more photos than ever but there’s an important next step which is often overlooked — organizing and archiving. Google Photos is my favorite solution for storing, organizing, and sharing photos and videos. It’s easy to use and it’s free, yet many people still don’t know about this useful resource. We’re here to help! 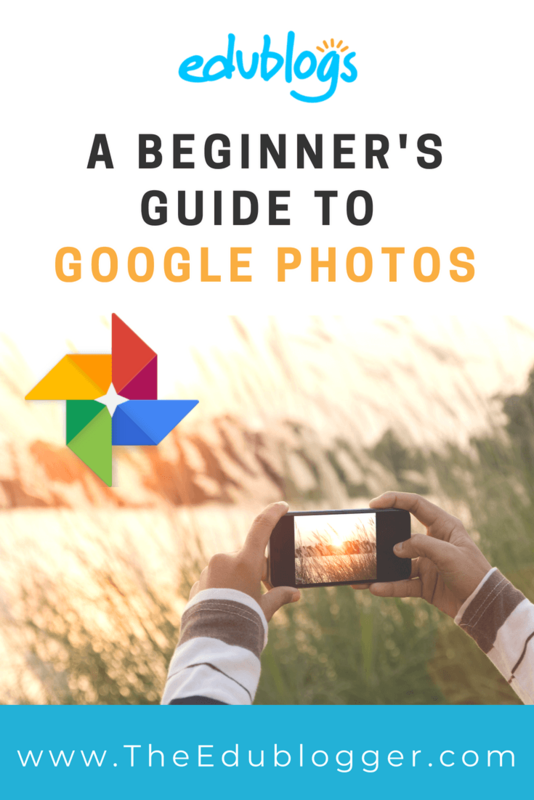 This beginner’s guide to Google Photos explains how Google Photos works, how to get started, and lots of tips and tricks for getting the most out of it. The Basics — What Is Google Photos? Google Photos is a photo sharing and storage service developed by Google. It was released in May 2015 and is now hugely popular worldwide. Google Photos stores your photos and videos in “the cloud” — this is just tech-talk for online storage. In the past, you might have plugged your phone or camera into your computer and laboriously transferred all your photos and videos. From there, you might have backed up your computer on an external hard drive. It’s quick and easy — you can set up backups to occur automatically. You can access your photos or videos from any device as long as you have an internet connection. Running out of storage on your phone is a thing of the past! Once your photos or videos have been uploaded, you can free up space on your phone. There are a number of services available where you can store your photos in the cloud. You get unlimited storage for free. You can pay if you want your photos stored with the original resolution but you’ll probably find the standard high-quality free version is fine. (Images over 16 megapixels are compressed to size, and videos are capped at 1080p resolution). It’s packed with numerous features to organize, use, share, and manage photos and videos. It works on all devices seamlessly. You don’t need to be overly tech-savvy to use Google Photos. It’s fairly intuitive and straightforward to navigate. Other people don’t need to have Google Photos to be able to view the content you share with them. To get started with Google Photos, download the free app from the App Store or Google Play Store. Open the app and sign in to your Google account. Chances are, you’ll already have a Google account (such as Gmail). If not, it’s quick and easy to sign up. Once you’re signed in, you simply follow the prompts to start uploading your photos and videos. Be prepared. This can take a while if you have a lot of images and videos. 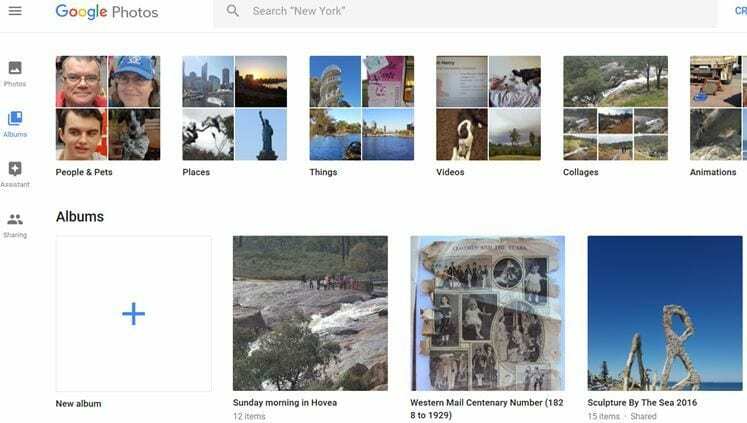 There’s also a web version of Google Photos for uploading pictures and videos that are stored on your computer. To view your uploaded photos and videos, you simply open the app or visit the Google Photos website from any device. 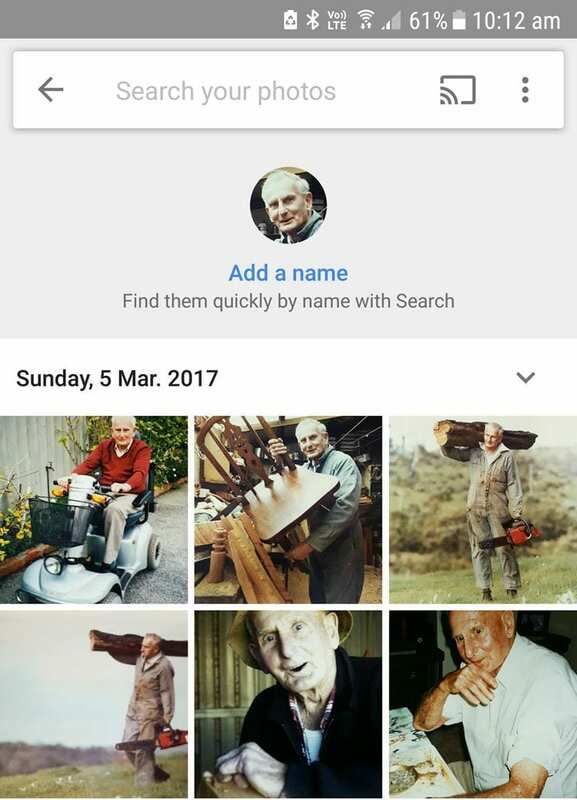 Go to https://photos.google.com on the web, or tap on the Photos icon in your app to view all your photos sorted in order of date uploaded. You view an individual photo by tapping on it. This is also how you access the options for editing and sharing a photo. Cast to – allows you to stream your photos from your phone to your TV using Chromecast. If you don’t have a Chromecast, you won’t see this icon. Favorite – adds the photo to your favorite’s folder. More Options – including where you can edit the photo information. Share – used to easily share a photo with others. The icon looks a little different on iPhone/iPad but is in the same position as the image above. Edit – used to apply filters to your photos; adjust light, color or pop; rotate or crop the photo. Google Lens – image recognition software designed to bring up relevant information using visual analysis. My phone is set to automatically upload my photos to Google Photos when I’m connected to WiFi. It’s a good idea to make sure this setting is turned on if you have a limited data plan on your phone. Open the app and press the menu/hamburger icon (three parallel lines) on the upper left of the app. Tap the gear icon in the upper right corner to access your settings. The first option is backup & sync. Toggle to activate backup & sync. Make sure the two options at the bottom of the screen, “Use cellular/mobile data to back up photos” and “Use cellular/mobile data to back up videos” are turned off. Google Photos boasts many excellent features. We’d also love you to share your own tips and experiences in a comment! 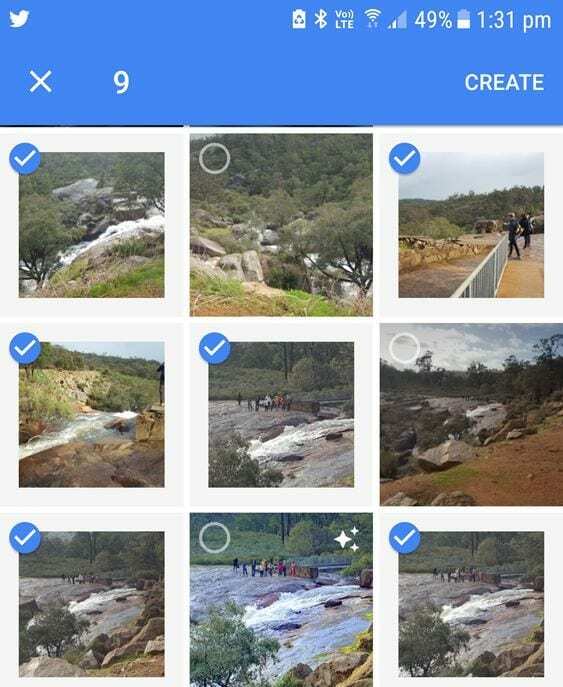 Google Photo search uses complex image processing techniques to group photos together which makes its search incredible and very accurate! This is handy when searching for finding photos you want to use or show others. 1. 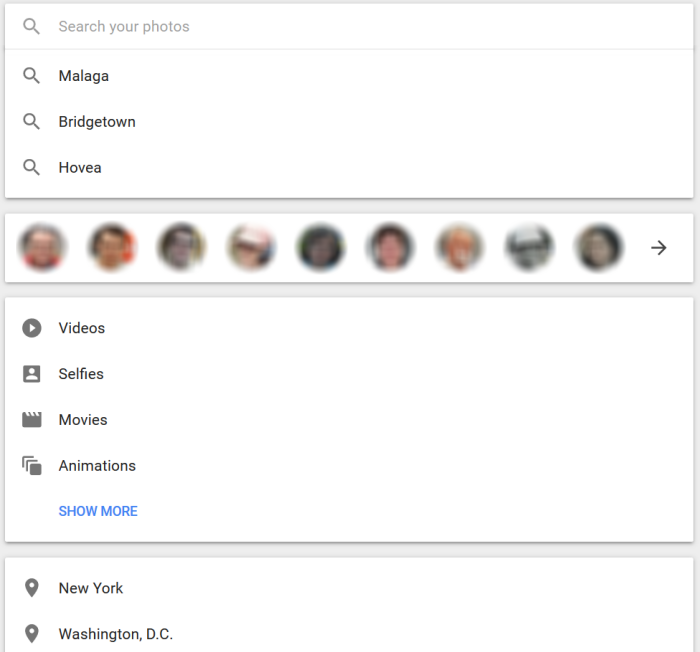 Click on the Search field at the top of Google Photos. 2. This loads the search window which lists recent searches, photos grouped by person, by media type and location. 3. Enter your search term. 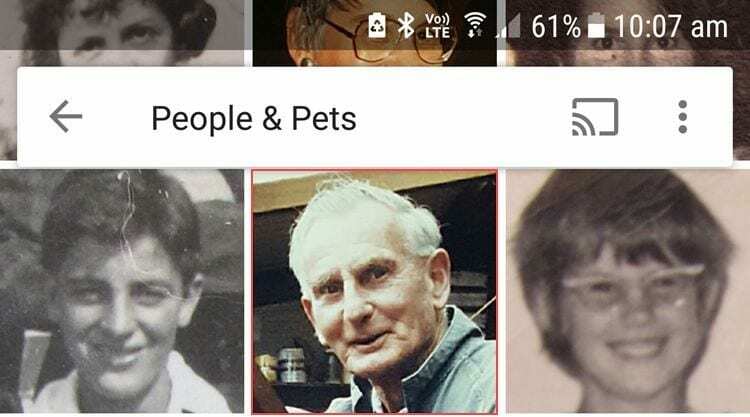 When you click on a photo of a person or pet, it pulls up any photo you’ve uploaded to Google Photos with them in. 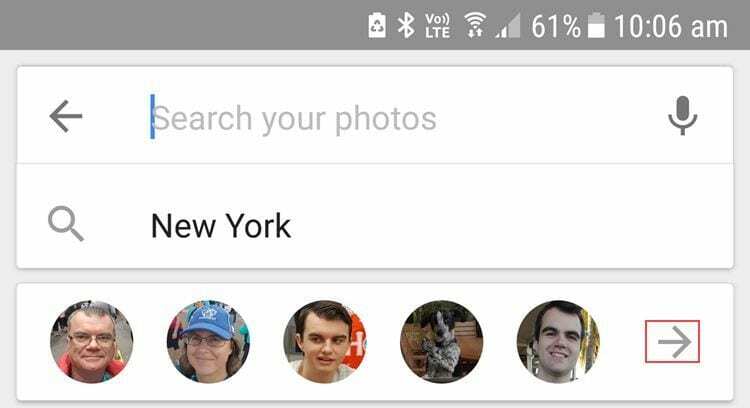 Note: Go to Settings > Group similar faces in your app and turn on Show pets with people if this is your preference. 1. Tap on More icon. 2. Tap on the photo of the person or pet you want to name. 3. Tap on Add a Name. 4. Type their name and tap Done if a new name. Or select from an existing list of names if matches an existing name you have already created and then tap Yes for merge. 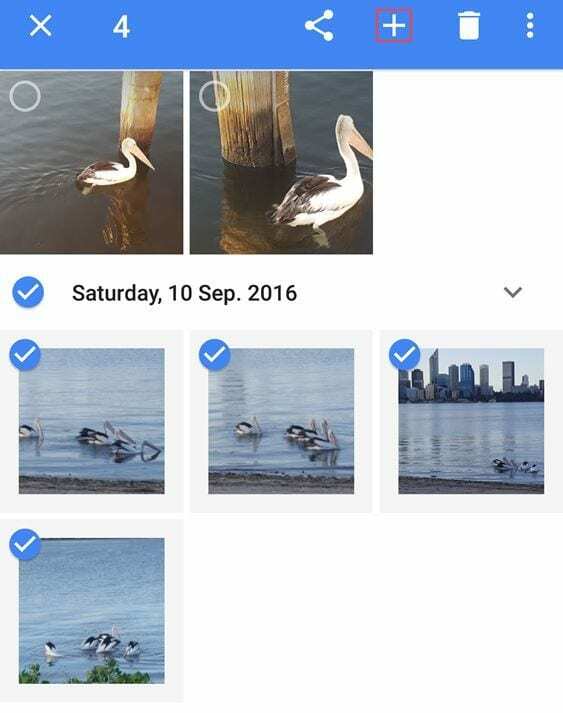 The Google Photos Assistant provides updates for what’s happening with your Google Photo library, alerts you to when new “creations” are available to view and act on, and provides information on the latest Google photo news. New “creations” are the automatically stylized photos, collages, photo albums, movies, and animations that the assistant creates from your photos. You can choose to save these automatic creations, ignore them, or delete them. It also shares “Rediscover this day” which are images from a point in the past as a reminder of past events. 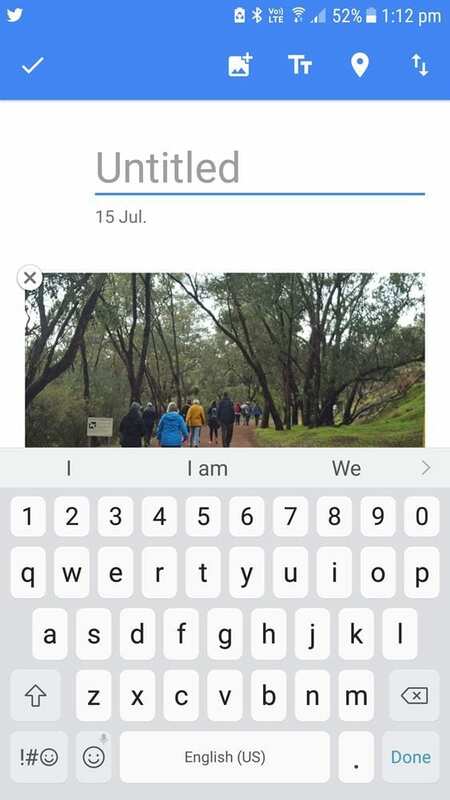 Go to https://photos.google.com/assistant on the web, or tap on the Assistant icon in your app. My favorite feature of Google Photos Assistant is the ability to easily create your own albums, collages, animations, and movies. 1. Tap on the icon for what you want to create. 2. Select the photos you want to include and then tap on Create. 3. Your creation is automatically saved to Google Photos. Google Photo Assistant can be used in so many different ways! You could share memories of learning or excursions on your class blog. Or perhaps you’d like to make a special video for a friend or family member. The possibilities are endless. A movie created from photos. 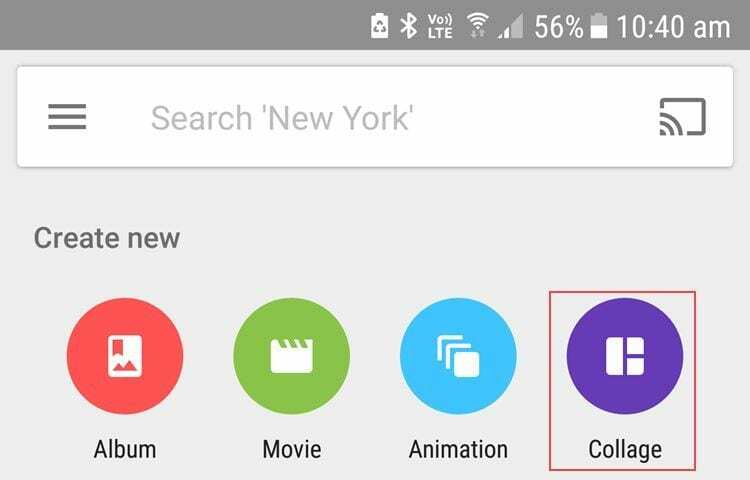 You can also use Google search when creating your own albums, collages, animations, and movies. 2. Enter your search term. 3. Press hard on a photo you want to add to your creation. This selects the photo and opens up the select box. 4. Select all the photos you want to add then tap on the + sign. 5. This launches the creation tools page. Select what you want to create from the list of “Create new” options. 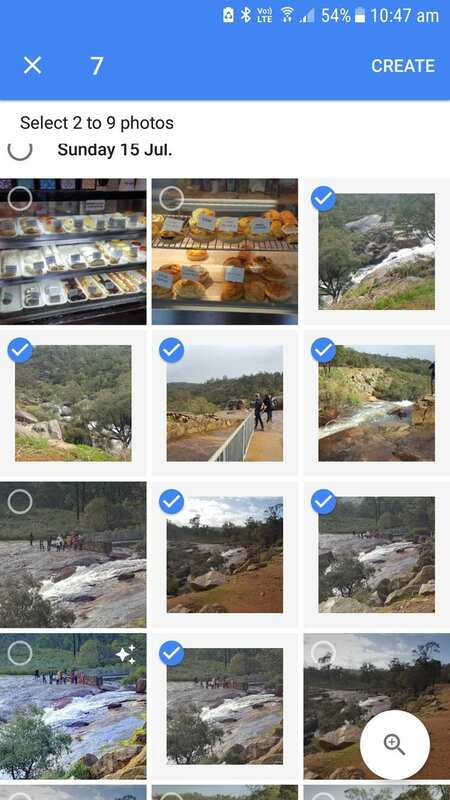 Google Photos uses its complex image processing techniques to automatically group photos together into Albums. Go to https://photos.google.com/albums on the web, or tap on the Album icon in your app. The automatically created albums are grouped at the top of the page and the albums you created are displayed below. 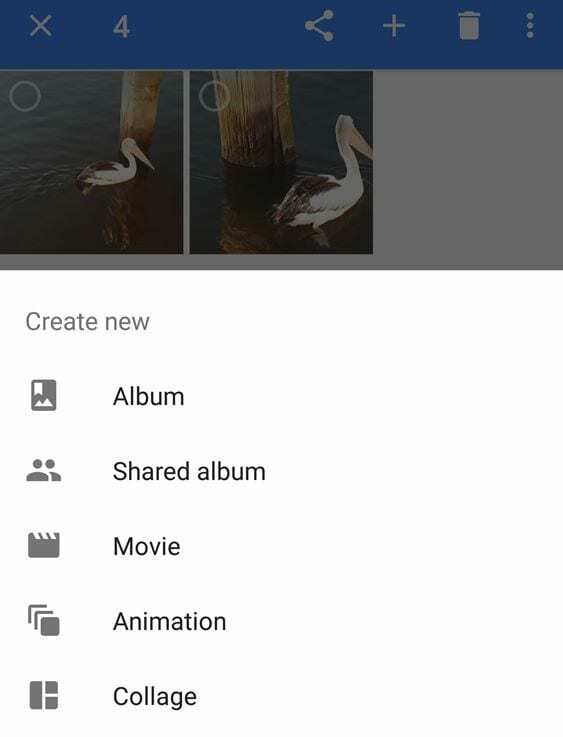 Google Photos makes it easy to add text to the photo albums you create! 1. Tap on the album icon in the Google Photos Assistant. 3. Replace Untitled with your title. 4. Tap on the Add Text icon to add a text box to your album. 6. 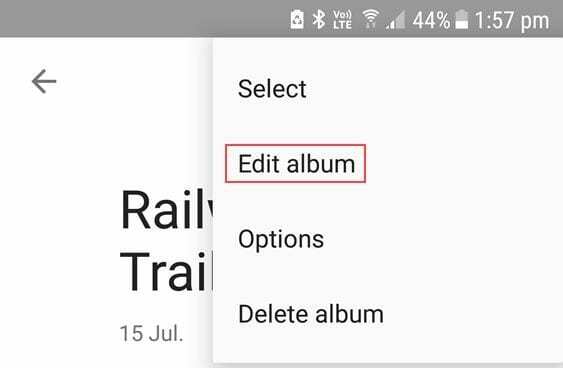 You can add as many text boxes to your album as needed and change the order of text boxes and photos. Press hard on the text box or photo you want to move to another location in your album then drag/drop to the new location. 7. Tap on the Save icon when you’ve finished editing your album. and then tap on Edit album. Google Photos makes it easy to share your albums with others! 1. 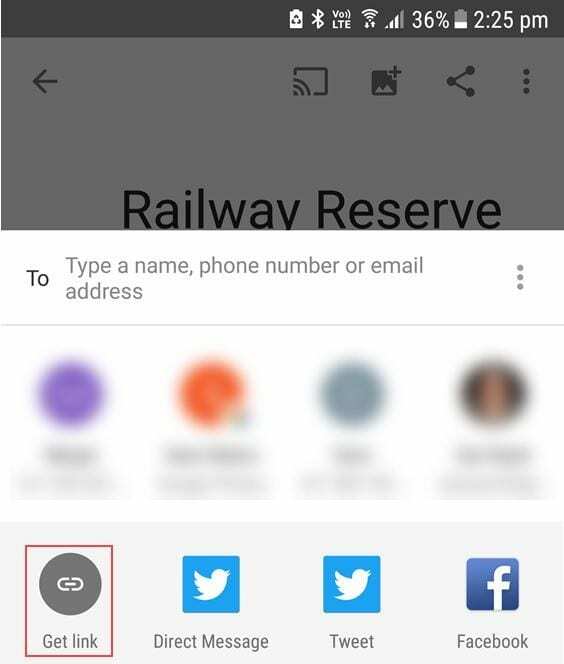 Tap on the Share icon inside your Google Album. 2. This launches the share options. 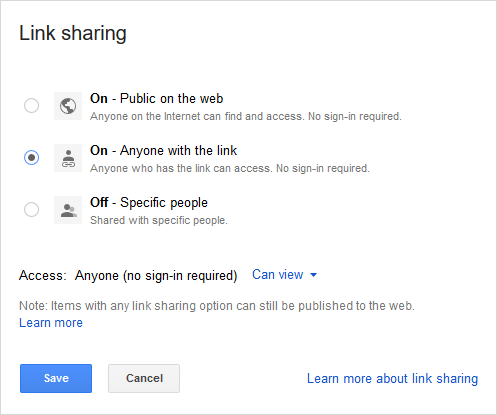 I usually share using the Get Link option. You may not always want to include the location where a photo was taken when sharing photos. 1. Tap on More options. 3. Tap on the More Link next to the location and then tap on Remove location. Note: Go to Settings > Remove geolocation in items shared by link in your app if you want to hide the location on all shared images. Here is one of my shared Google Photos albums with text added so you can see what it looks like. Google Lens is image recognition software designed to bring up relevant information using visual analysis. When you view a photo in your Google Photos app on your mobile device, you’ll see a Google Lens icon. 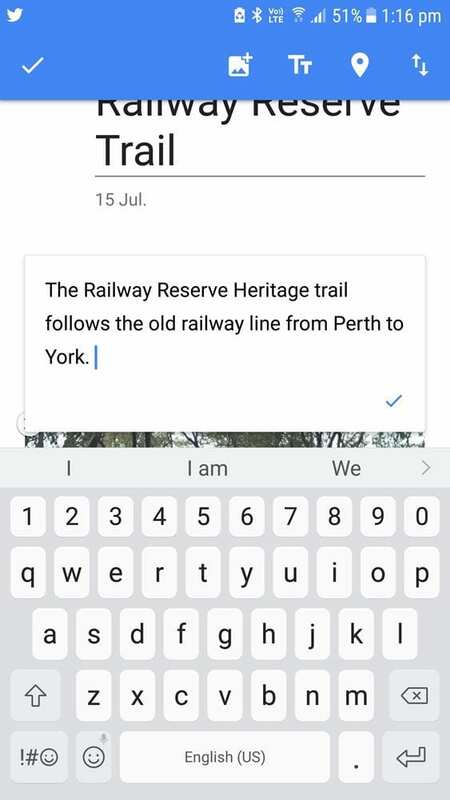 Tapping on the Google lens icon makes the scanning dots appear on your picture and then Google will serve up suggestions. 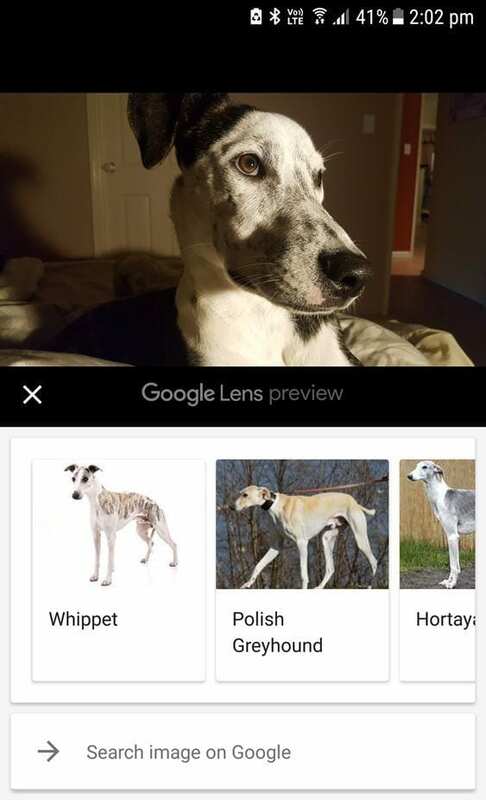 Googles Lens suggests my photo is most likely a photo of a whippet. 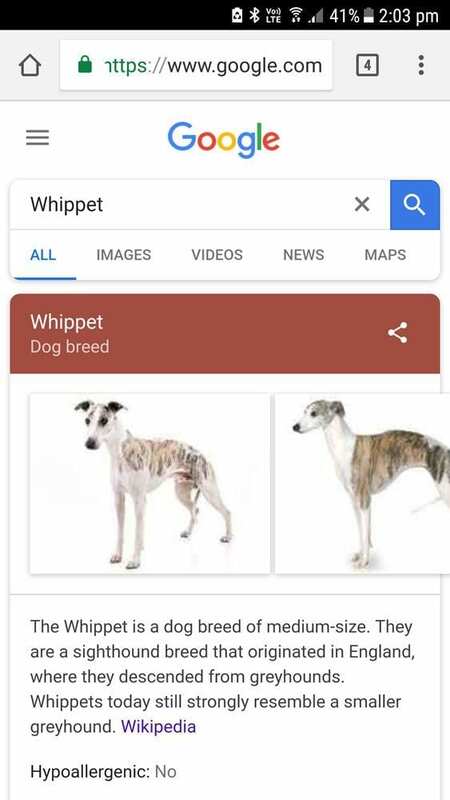 Tapping on whippet launches the result in Google Chrome. Many people find that one of the biggest advantages of Google Photos is freeing up space on your phone. No more frustrating “storage full” messages just as you’re about to capture a precious moment in time. 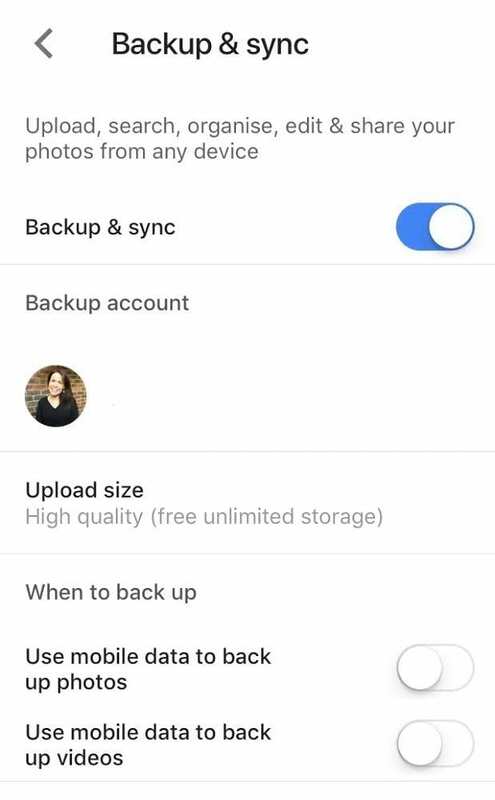 Once your photos are backed up in Google Photos, you can free up space on your phone by going into settings in the Google Photos app and selecting Free up space. 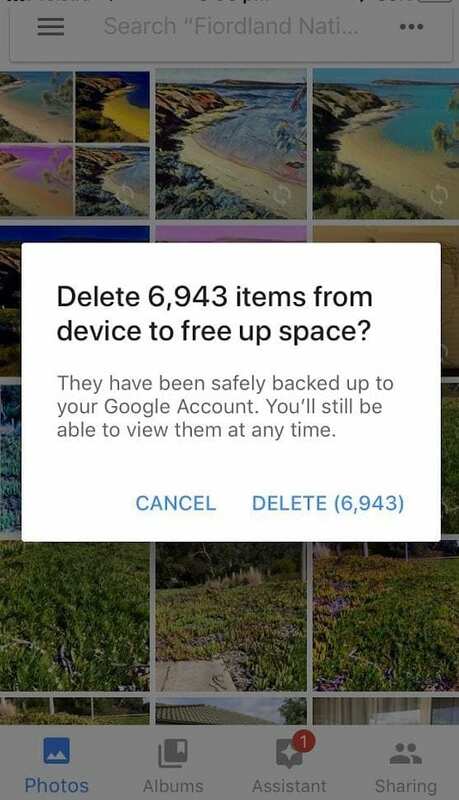 You’ll then get a pop up telling you how many items can be deleted from your phone. Remember, you’ll still be able to access these photos at any time via Google Photos. They’ll just be gone from your phone’s camera roll. If you delete images from your phone but want them back again, downloading from Google Photos is straightforward. Open the Google Photos App. Tap on the image (or select multiple images) that you want to download. Press on the triple dots on the top right. Tap on download or Save to device. You can do the same on your computer with the web version of Google Photos too. Click on the photo you want to download. Click on the three dots. If you have albums or shoe boxes full of old photos lying around the house, it’s a good idea to digitize these and safely store them online. 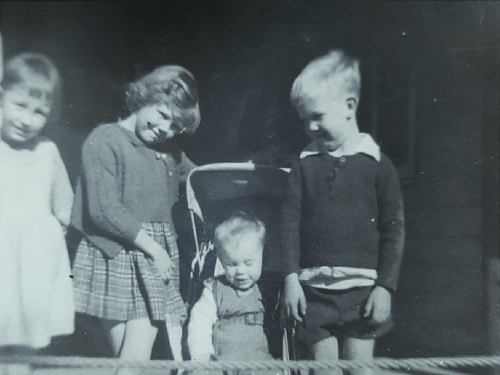 Most of my old family photos were digitized using the above technique using a digital camera. This technique won’t work for the newer glossy photos due to glare issues. The solution is to use Google’s PhotoScan app on your phone. The PhotoScan app works the same as an image scanner but is easier and means you can do it using your smartphone. Here’s the same photo taken with the PhotoScan app. Tap the shutter button. Four dots will appear and you hover your phone over each dot and hold in position until the dot is filled. Once completed, PhotoScan stitches together a single image from several overlapped photos eliminating any glare and evening out exposure. Here’s a video to show how easy PhotoScan is to use. After you’ve finished taking your high-resolution, glare-free images using PhotoScan, you just back them up to Google Photos along with your more recent photos. Just search for PhotoScan in your App Store. If there are specific people you always share photos with (e.g. sharing photos of children with your partner), you can add them to your Google Photos account. Simply go into settings in the app and tap on Add partner account. You’ll then be prompted to enter your partner’s email address and choose what you want to share. This could be items from a specific date or photos of a specific person. You can change or turn off these settings at any time. Looking for more ideas for using Google Photos? Check out Ryan O’Donnell’s Power Tips shared with us courtesy of Brian Briggs. To access the links in Ryan’s Google Photos Power Tips you need to visit his Google Drawing here! You’ll find other great Listicles created by Ryan O’Donnell here! If you’re unsure about your Google account being jeopardized, you might consider turning on 2-step verification. This means you’ll enter your password as normal and then be asked to enter a code that’s sent to your phone. Want to learn more about passwords? Check out — Updated Password Advice: What Teachers And Students Need To Know. Just go to Google’s 2-Step Verification page to set up this extra security measure. If you have a blog or website, you probably know that a picture or video tells a thousand words. It can really break up your text and bring your content to life. Embedding photos, videos, or albums from Google Photos is straightforward. Just follow the tips below. 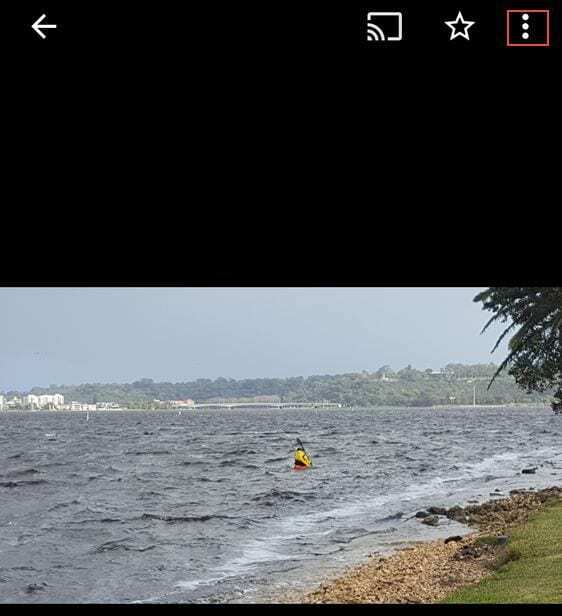 Want to embed a video but don’t want to upload to YouTube, like my video of dolphins in the Swan River? Would you like readers to be able to zoom in easily on a photo? Like my photo of my Ockerby ancestry below compiled by Rev Thomas Ockerby Hurst (my great-grandfather) in 1939. You can do both by embedding Google Photos into your website. 1. Log into Google Drive in the web browser on your computer using the same Google account you use for Google Photos. 2. 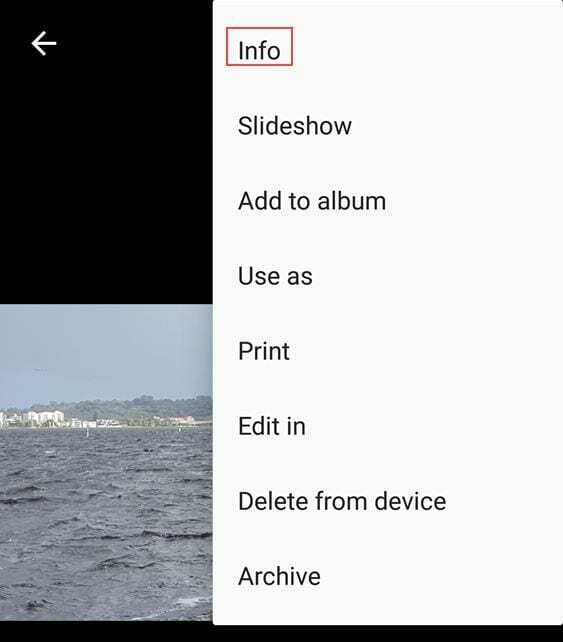 Click on Google Photos folder in the left sidebar (photos and videos are automatically added to Google Drive). 3. Click on the video or photo you want to embed and then click on the More icon and select Share. 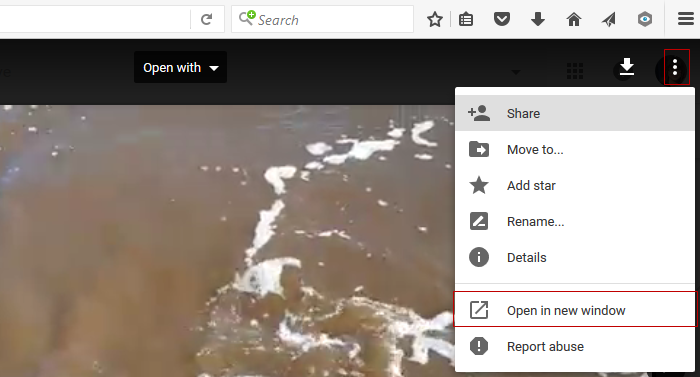 Videos take some time to upload to Google Drive from Google Photos. If the video has only recently backed up to Google Photos it mightn’t appear for a while in Google Drive. 4. Click on Advanced option in the Share window. 6. Click on Change next to Private. 7. Click on On – Anyone with a link or On – Public on the web and then click on Save. 8. Click on Done to close the Share window. 9. Click on the More icon and then Open in new window link. 10. Click on the More icon in the new window and select Embed item. 11. Copy the embed code. 11. 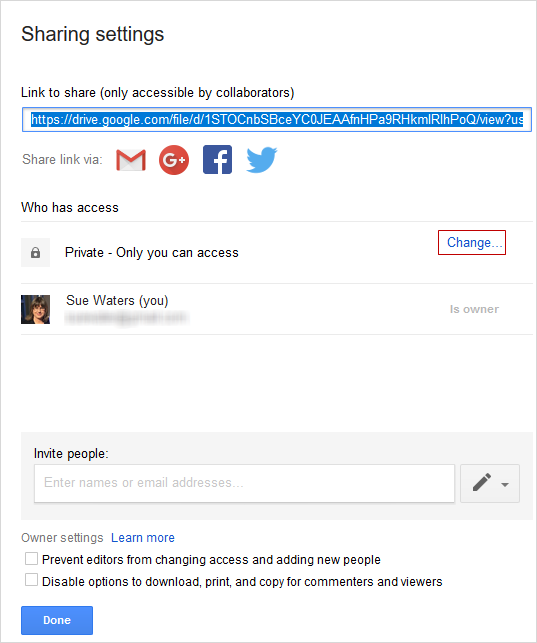 Paste the embed code into your post using Insert Embed Code in the Add Media Window and then click Insert Into Post. The method you use will depend on the website or blog platform you use. This is how you do it on Edublogs and CampusPress networks. 12. Once your post is published you’ll see your photo or video embedded. 1. Log into Google Photos on your computer. 2. Click on the Album you want to embed. 3. Click on Share icon. 4. Click on Get Link. 7. 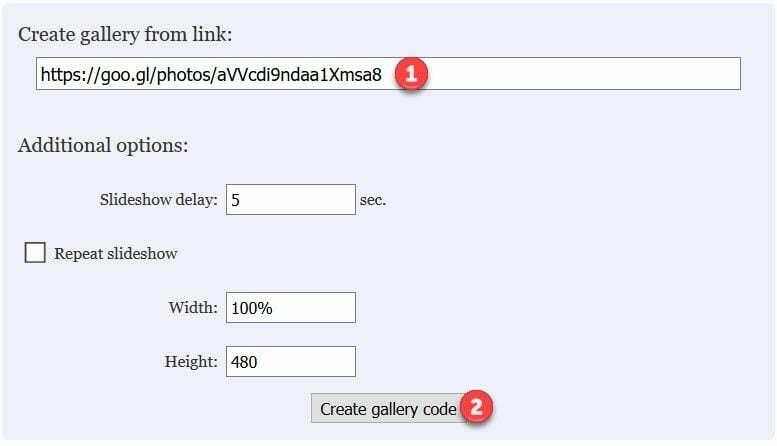 Paste your Google Albums link into 1) Create gallery from link and click 2) Create gallery code. 8. Click on Copy code into clipboard to copy the embed code. 9. In your blog dashboard, click on Add Media > Insert Embed Code. Paste your code and then click Insert into Post. 10. Once the post is published you will see the album embedded as a slideshow. 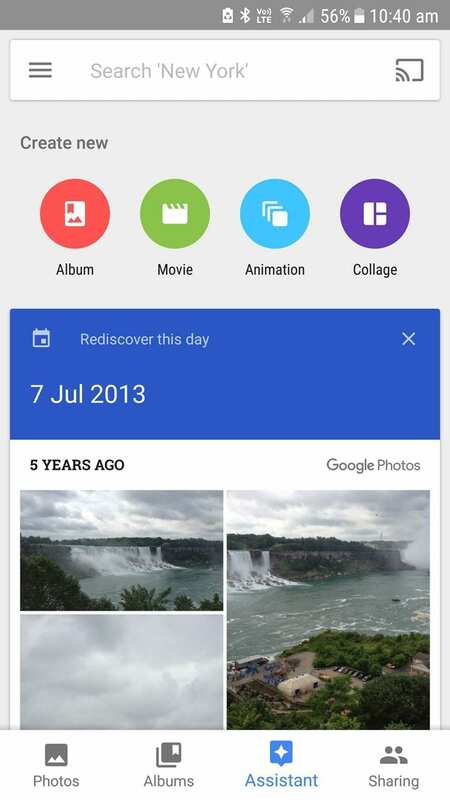 Below are two different examples of embedded Google Photos albums so you can see what the embed looks like. 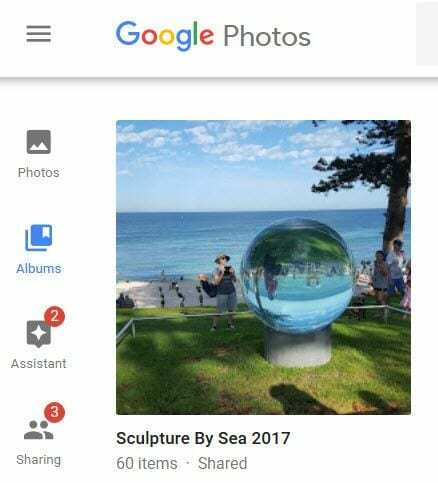 My photo album from Sculptures by the Sea. Viewing this slideshow on a mobile device allows you to zoom in to read the text. “The Western Mail” Centenary Number publication which was published in July, 1929 to commemorate the 100 years of the founding of Perth and the establishment of the Swan River Colony, the first permanent European settlement in Western Australia. The 80 page publication highlights the development and history of Western Australia from 1828 to 1929 in Perth and country towns. It includes photos from the 1800s to 1929 comparing changes in the city, towns, Parliament, transport, sport, fashions, primary production. The publication was sold for 1/6 in July, 1929. 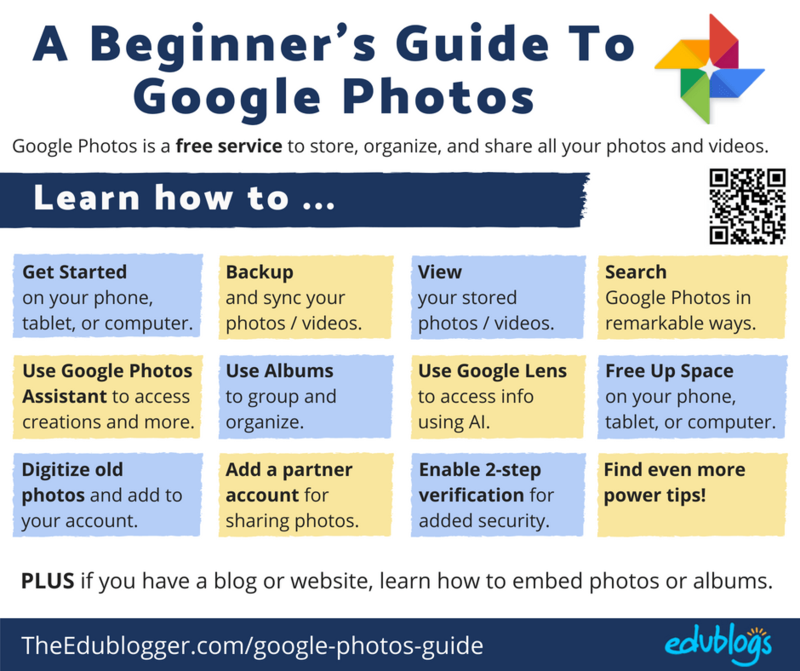 Tip: Find out ideas for using Google Photos Albums in the classroom in this post. You can easily view and retake photos until you get the perfect shot. There’s no waiting around for images to be processed and printed. Images can be shared with family and friends in seconds, either privately or on a more public platform. There are countless ways to transform images with filters, collages, slideshows, or video. Most people have a phone in their pocket when they’re out and about so capturing the moment is so easy. With all these advantages of digital photography, we shouldn’t totally forget about having hard copy prints of our precious memories. Having a physical print, perhaps in a frame, or in a photo book can really bring the images to life. 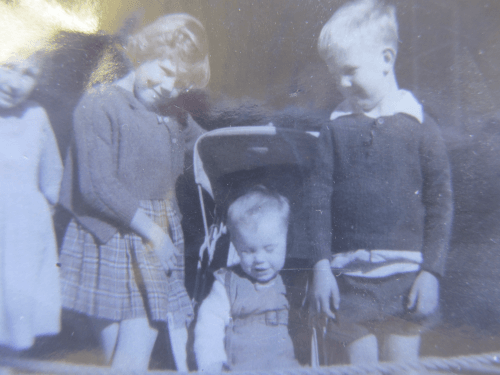 From a family history perspective, it can also be nice to have some carefully curated memories to pass on. Google Photos helps with this too. If you’re in the USA or Canada there is a Google Photos Book printing service. If you’ve tried it, let us know! For other countries, you’ll find that many popular photo printing and photo gift services (like Snapfish or Shutterfly) are now integrated with Google Photos. So, if you want to make a photo book for example, you can search through your Google Photos while you’re making the book. This can be a real time saver when looking for images from certain times, locations, etc. I hope this information helps you organize, store, and share all your photos and videos! Please leave a comment below to provide tips on using Google Photos or let me know if you have any questions. Your article says Google has unlimited free storage, but on my phone Google tells me that I have 15 GB free and after that I have to pay. I’m unclear why this apparent difference. You’re right — your Google account includes 15 GB of free storage to use across Google Drive, Gmail, and Google Photos. Google Photos has two storage settings — original quality and high quality. If you upload your photos to Google Photos in original quality then this doesn’t count towards your 15GB of storage. If you upload photos in high quality it does count. 4/14/19 Hi, I just wasted about 6 hours (very slow old phone, NO computer) attempting to finally organize/group photos AND memes (huge collector) in the actual Gallery+ app (area?) … & to my horror, when I went to check on the 300, or so, pix/memes I had put in the many albums … 98% are chopped-off/cropped-off AND blurry! Can anyone tell me WTH is going on? Is it my phone or just a VERY BAD FEATURE in Gallery+ that needs to be axed/86’d? 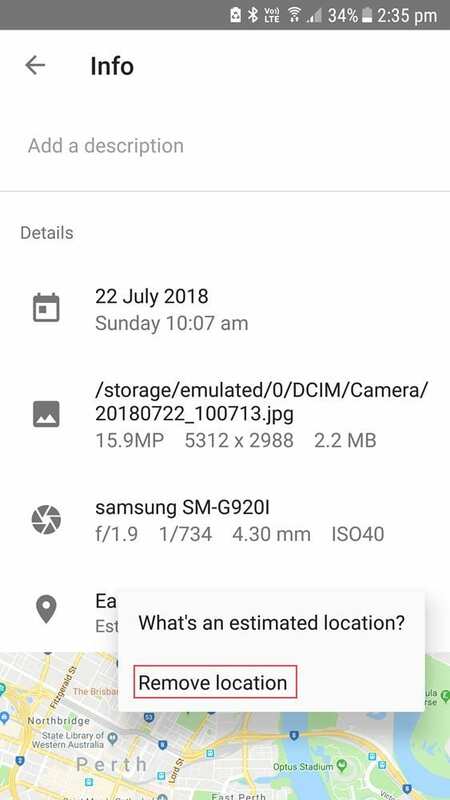 Im very computer illiterate, so Im just assuming that the pre-installed Google Photos & the pre-installed Gallery+ are somehow connected. 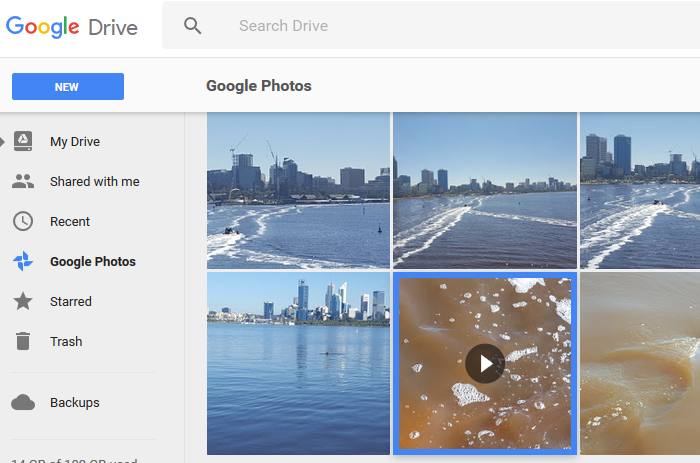 Thanks for a great and informative blog post about Google Photos. I’ve just recently started using this service and I now uploaded my raw files too (CR2). These files are typically +20 MB. You mention files above 16 MB will be compressed to (as I understand it) 16 MB max. Is this correct? When I upload the raw files they are compressed to < 1 MB. The information that Google provides says they are compressed to a maximum of 16MB. Unfortunately, I can’t find any information about the exact algorithm Google uses to determine the compression size. If you come across any more useful information please let us know so we can update the post! Why don’t the dates for the photos remain with the photos when the photos are added to an album? You’ll see the date range for the photos at the top of the album. To find out the date of an individual photo, click on the photo, click on the i (info icon) and you’ll find the details there. I can’t seem to get Google Photos to move the pictures to a folder in my Google Drive. I’ve followed the instructions here: https://support.google.com/drive/answer/6156103 except I don’t see an option for “auto-add.” Any idea what’s going? The forums are useless. 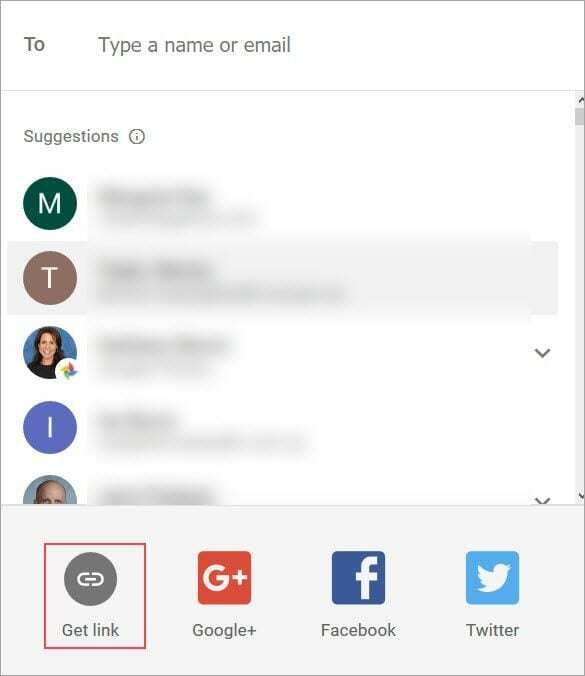 Can you tell me why the length of text is limited when I e-mail a photo from Google Photos using my gmail? Also, why doesn’t the sent e-mail show up in my Sent of gmail? Lots of good info, thank you. I’m not sure about those questions but I bet the Google community can help. Here’s the link to the Forums. I will give the forum a try. Thank you for the reply. You rock. This is an amazing tutorial! I think there’s only one question not answered… it’s the one that brought me here. I am going to buy a new phone and I’m afraid it will start with photo file naming with file #0001 which my old phone started with and that photo is stored in my Google Photos account. Will a new file #0001 overwrite the other one? Do i need to figure out how to start my new phone at the end of the old phone’s file names (like file #999,999,002 cause I take A LOT of photos)? Am I making sense? Thanks! I’m pretty sure if you have different images with the same file name they are treated as unique. 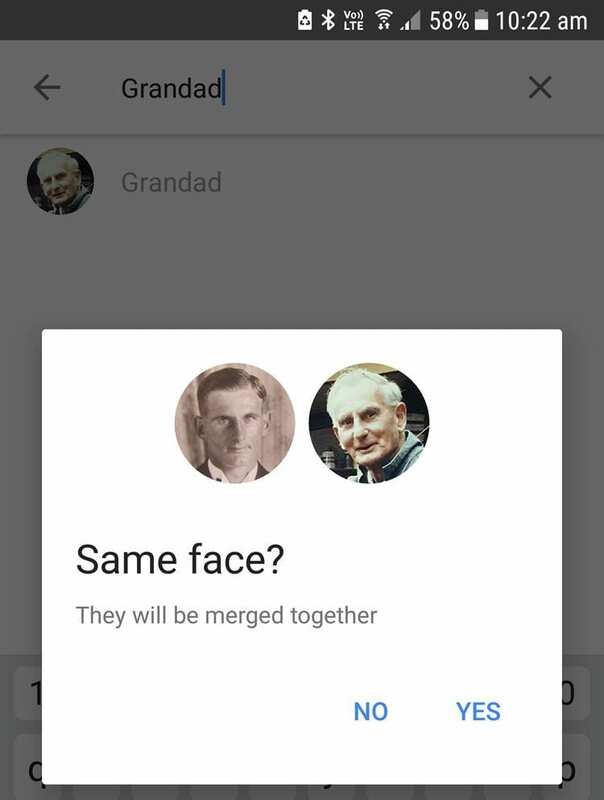 I believe Google can recognise the photos as being different. So you shouldn’t have any trouble but you could always try testing it out to be sure and if you do please let us know! Can you tell me how I can stop the face tiles being added to google photos. Thousands of them appear when I have tried to save photos from my Mac at home. I’m not a Mac user and haven’t come across this issue myself, however this forum question might help? If not, you could reach out to others on the Google Forums. I moved some photos into a separate album, but I do not want those photos to appear in my general photos as they are private (for a surprise book). If I delete them from the general photos (the page that opens when you go into Google Photo), will they also be deleted from the album? I haven’t tried this personally but this article seems to have some helpful info about private photos. I’m sorry I’m not sure about this but maybe another reader can help or you could reach out to others on the Google Forums. Your article is very informative and interesting! Thank you. (Just as a backup). Or is there an option to copy them? The photos in your Google Photos account will stay there even when you download them. I often just download a handful of photos every now and then when I need them for a certain project. 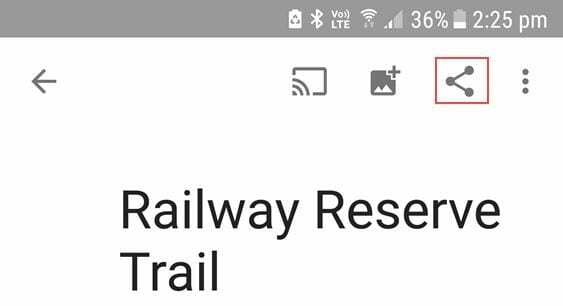 I am trying but Google Photos at this point of being stupid. I had and have thousands of pictures on Picasa. Moving pictures around putting them in the order I want not google. A lot less ability to edit pictures. eg On costal, hazy or writing as in a sign I use the contrast all the time. Even takes a black & white dull picture and really brings out the nice contrast and awesome picture. Another example is I made a trip to the Oregon coast and on the way I stopped and took a couple of pictures of a river and a down log. Went on and had pictures of a memorial, the waves, the city, etc. Google did not know I wanted those in a folder called “Coast May, 2018.” Let me do what I want. I spend more time editing pictures in my “darkroom” or computer and google photos just doesn’t hack it. So where can I rally find out how to operate this thing? I am sorry to disagree. Sorry to hear you’re still having trouble with Google Photos. I know when I’m having trouble figuring something out, watching a video on YouTube can help. Maybe that’s your next step. 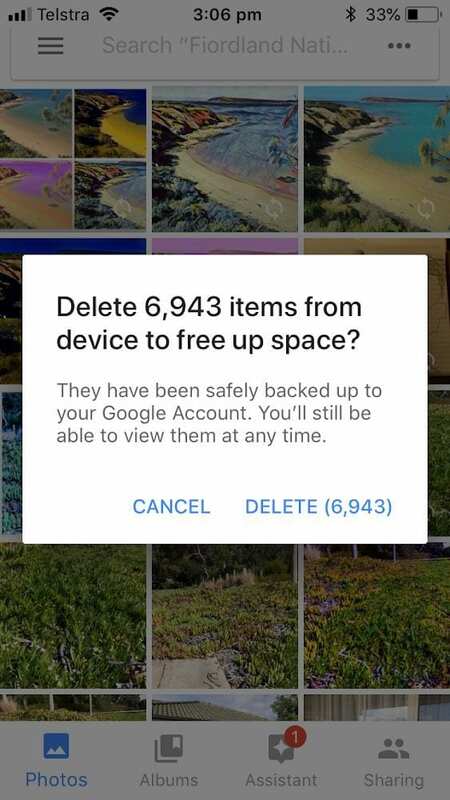 If I unload the Google photos, will my photos go back to gallery ,or will I lose them, for good, if I hadn’t already? Yes, you will need to log in to your Google Photos account with the account you were in when you uploaded them. Also, you won’t lose your original photos unless you select the option to delete them yourself. I have a lot of albums on Snapfish and I want to move them (or copy them) to Google Photos. What steps will I need to do to get that accomplished? Thanks! I think you have to download the photos from Snapfish to your computer. From there, you’ll need to upload them to Google Photos. You can do this by going to https://photos.google.com/ and clicking on ‘upload’. Shame there is no one-step process (that I know of). I encourage others to chime in if they have a different approach. Hi!! Thanks for taking the time to write this review!! It’s incredibly detailed!! I have a question though. I store my photos on an external hard drive that it’s synchronized with Google Photos. I’m running out of space on the disk (which is also getting old), so I want to migrate all of it’s content to a new external disk. 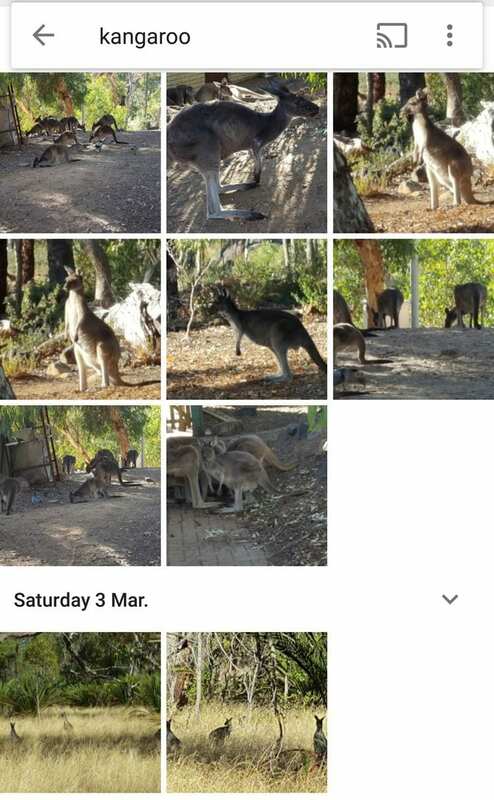 How can I make Google Photos recognize that those are the same photos and do not duplicate them? And not have to upload them again…I have aprox 2TB of photos in the old drive. I’m glad you enjoyed the article. Good question about migrating. Have you tried doing it yet? 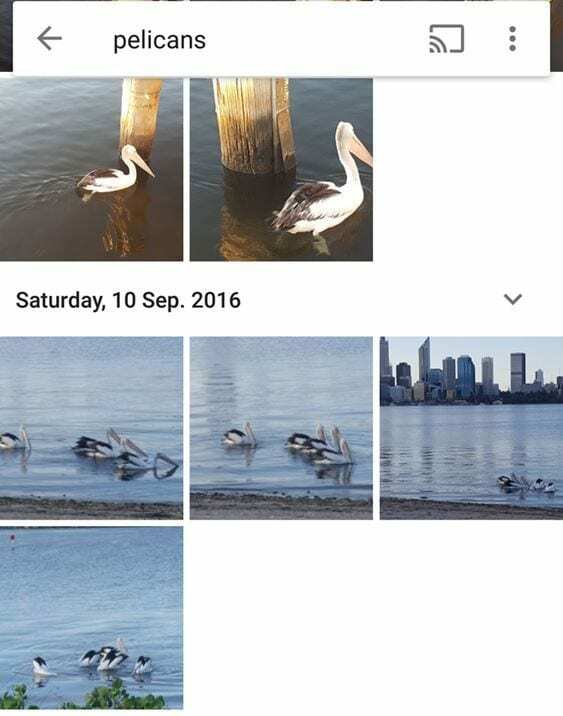 Apparently, Google Photos recognizes duplicate photos and skips them even if the file names are different etc. Clever! This is the best I have found so far. Here I am. I am 85 years old. Have enjoyed photography since my mid teens. I did slides till mid 90 then started to take more hard copies and put in albums. Since 2002 I have been using a Digital and moved up to a better camera from time to time. In that same year on my computer, I saw and started to use Picasa where I named the folders by year and then by subject as Trip to coast, John BD, Christmas. Christmas time pictures might be from the securing the tree to Christmas Day. I might list them like “2018 Christmas activities Church kids program 12-15-2018”. I think you get the point. I love Picasa and the ease of editing, rearranging pictures, and I could undo all edits step by step and redo as I desired. With Google Photos, I can’t do anything. 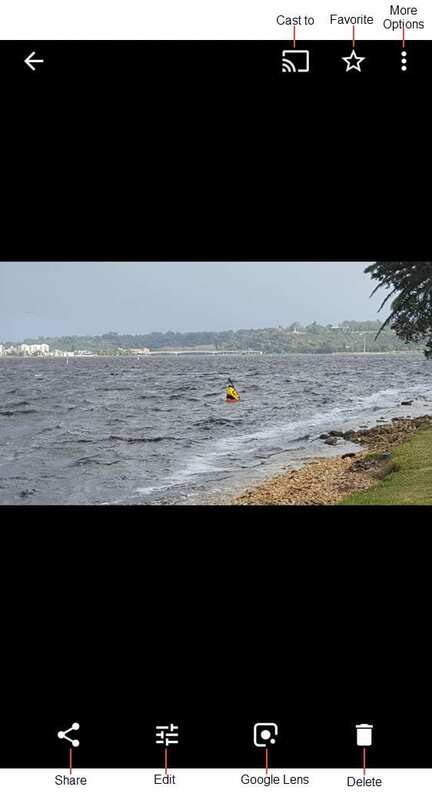 The other day I went to the coast and took pictures of a river on the way, some trees, then the local town and maybe a war memorial, the beach and a unique picture of some beach grass and a log. With Google Photos, it thought it knew but did not, how to select & arrange because I guess it thinks it knows how I want to arrange the pictures like I desire. I normally on the computer do something to almost every one and a big part of what I enjoy is working on the picture to create how I so desire on the computer. In high school I used the dark room to start working on some. What I have looked for is a illustrated book on Google Photos or a couple of chapters in a Google Illustrated book as there are for so many apts and or programs like Windows 10 simplified. My 20 year old granddaughter tells me to get with it. I would love to keep doing it with Picasa and I have thousands of pictures in it. It will not allow me for some reason as days ago to import pictures as I have last year. Strange I can scan pictures one by one and they go there just fine. Is there any way to help this old man enjoy photography as I have most of my life or has this come to an end for me then shoot me? Thanks for your advise. Hello! I have TONS of photos on my Google Drive and I’d like to move them onto my Google Photos. Is there any easy way to do this? You’ll need to toggle this option on. I have thousands of pictures on my computer. Most are on Picasa and for me it has been a program that is just great. So no longer has Google stopped using it. I am 85 and not that easy to change horses in the middle of the stream. I have tried and my 20 year old granddaughter understands this but I need a “visual how to book” which I have secured showing me step by step how to do it all. I read on the computer articles like from you and think it is great but I then back out and how to remember the 25 steps to follow. I am so discouraged that I am about ready to stop taking pictures. I tried to use my SD card from my android phone and never had a problem but not it won’t permit the transfer. Maybe Picasa is not Photo shop but it works for me. I have tried to google visual books for Google Photos and cannot find any visual material to buy. I have read a number to questions and love how you explain but try to remember??? Can you and someone help me. By the way I can still copy some older photos and they go into Picasa just fine. My lover, I guess. Help!!!! Sorry to hear you’re having trouble with your photos! Hopefully, you can get your granddaughter or someone else to sit down with you and walk through it all. And well done being such an active technology user at 85! Thank you for the nice article. I have been using Google Photos for several years. I always have my photos uploaded automatically from my Android phone; then I manage photos from a web browser on my laptop. It appears to me that it recently changed: I no longer see a way to select multiple photos and then add them to an album. I only see that I can do this one at a time. Is this an intentional downgrade? I just checked and I can still add multiple images to albums the same as usual. In the web browser version, I just click on the photos I want to move and then click on the plus icon at the top to add them to an album. Not sure why you were having trouble but maybe you could test it in a different browser or clear your cache? Thank you, Kathleen. I just tried it again and now the word “Album” appears in the list when I click on the plus icon. I am not certain as to why it wasn’t showing up during the last few days, but perhaps clearing the cache solved it. Also, I noticed that my browser (Firefox) just got an update yesterday as well. One of these events must have corrected the anomaly. That’s great to hear, Tom! It’s nice when you find an easy fix. I used Picasa primarily so that I could print two or more images onto a single sheet of premium photo paper rather than printing one image per page. Unless I am much mistaken this facility is no longer available. I don’t want to pay a photo printing service to print my images. I should have checked this out before I uploaded my 2,500 images to Google Photo, a process which took 10 or more hours to complete. Hi Michael, you’re right that Picasa has retired. I’m not too sure about the printing options with Google Photos. I do know photo printing services like Snapfish now link with Google Photos if you decide to use a printing service in the future. Hopefully someone else who prints at home can offer their insights here. 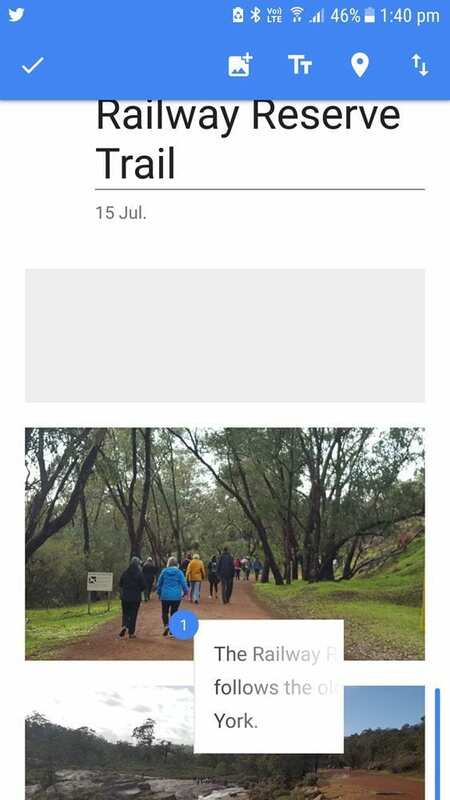 The google photos guide has been very helpful to me…luddite that I am.–Thanks! Good info. Thanks. I’m pretty new to the platform and I’m struggling to find a way to pull photos from google photos to use elsewhere now. For instance, uploading a photo to a website I use, into a document, etc. Because they’re not on my hard drive I cannot access them as an attachment or as an upload. I’ve watched videos, tried multiple suggestions and nothing. Any ideas? If you want to add one of your photos that stored on Google Photos to a document, for example, you can download a copy when you need it. You save the photo you want back onto your computer or phone then upload it into the document in the normal way. These instructions show you how to download either one photo or all photos. You can click on the tab at the top to get instructions for Android, Computer, or iPhone/iPad. I use Google Photos and also Google Chrome on my PC. When I try and share a photo to, say FB, when I click on individual photos, I don’t get the SHARE icon at the top right of the screen. I tried using another browser (IE) and I do get the share icon. I like Google Chrome-any idea how I can get the icon to appear? I just tested myself in Chome and I can see that share icon. I just clicked on the image and then it appeared in the top right next to other icons like edit, zoom, info etc. So it sounds like a mystery! Hopefully another reader might have some insights. Good luck! What about sharing to Facebook. So far when I have shared it gives a preview but then people need to click the link to see the full album. Is there a way to share direct with Facebook without downloading the photos first? Have you had any luck with think? 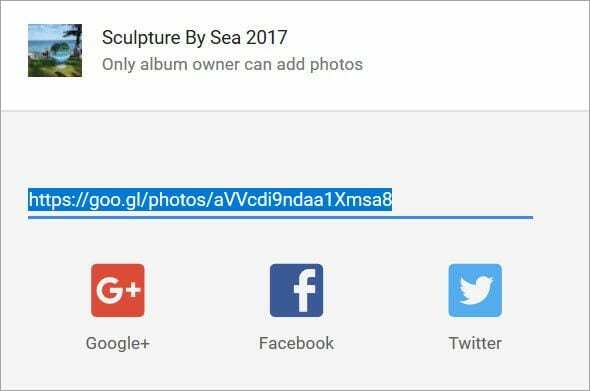 I read that if you click on the individual photo(s) you want in Google Photos, then click on share, you can share it to a Facebook album? Hopefully the photos will then be shared directly? If you have success, please let us know! Hello and thank you for this thorough article. My question is about seeing the photos. I used to click on Google photos and it would go to Albums then Camera to list the photos by date. Now it always starts me at Photos – still listed by date but they are much larger so it’s harder to scan through them. Can you help me fix this? I’m glad the article was useful. I’m not sure about this change in appearance. Hopefully, if someone knows the answer to your question, they’ll be able to chime in. I can’t see any way of changing the way photos are displayed in settings. I know I find it helpful to just use the search bar to look for photos I’m after. I’ve also found it helpful to use the scrolling date tool that shows up on the right hand side (when you’re on a computer). You can also switch between photos and albums on the left hand side when you’re on your computer. What is the purpose of albums and archive? Albums are just a way to organize your photos. Similar to an analog photo album! Archives are for photos you don’t want to delete but don’t want to show up on your stream. These might be photos of documents or screenshots etc. 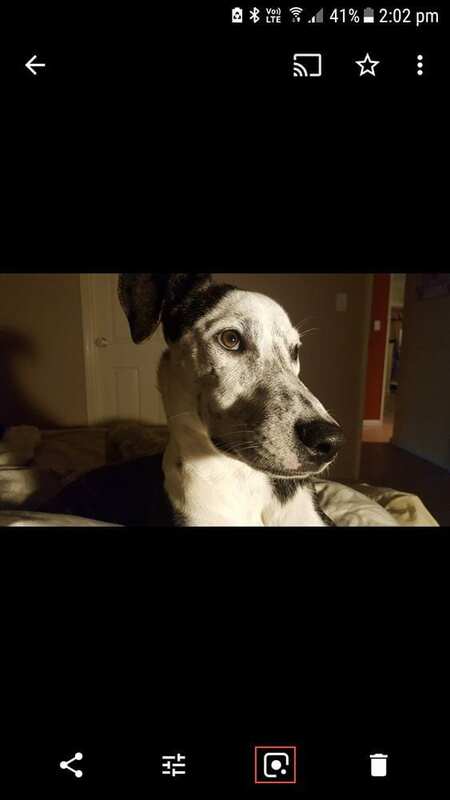 I have recently discovered Google Photos and have been able to share two albums with one person and have a third that for some reason won’t share. Is there a glitch with this app? Hi Clara, I’m not sure but perhaps you could try again or sometimes when I’m having trouble with apps it’s because the app needs to be updated? Good luck! Is there a way to place text on an individual photo in an album? I appreciate the information about adding text to the album itself, just wondering if it is possible for each photo individually. Ver nice post. Public album widget was completely updated last month. Now you get static HTML code with link of photos decorated with Player (https://www.publicalbum.org/blog/embedding-google-photos-albums) component or you can use WordPress plugin (https://www.publicalbum.org/blog/wordpress-google-photos-album-plugin). Google photos is awesome. I always have it turned on on my phone to sync any photos that I take and I haven’t lost a photo since 2011 (because I let it grab stuff from my memory card too). I like the rediscover feature and the auto-created content. Didn’t know you could embed stuff though so thanks for letting me know about that. Amazing post. Hi Kenyata, I pretty much feel in love with Google photos after switching to an Android phone. Makes it so easy. Love rediscover feature and the auto-created content. Hope the embedding helps! Thanks Gwyneth! Stopped using Flickr years ago for a range of reasons including 1) auto uploading by Google photos made it easier. 2) Changes to their service over the past few years concerned me. 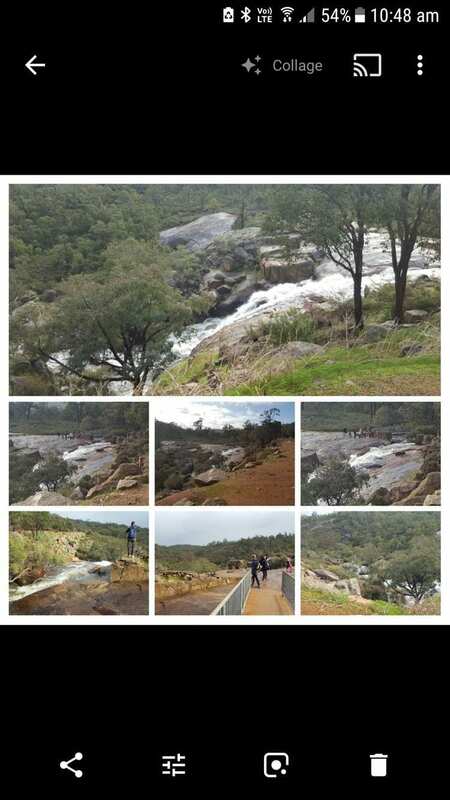 I found even more locations where you can see kangaroos for the next time you visit Perth. Excellent resource, thank you! I’ll be using it with adults at community technology sessions I run for our library. That’s fantastic! Good luck with your sessions! 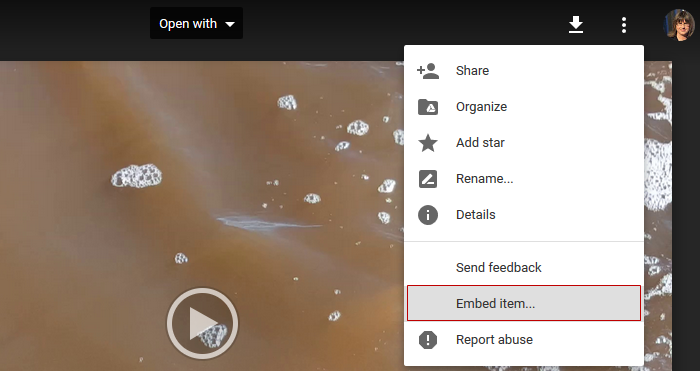 Do the Google Photos embed options work with free Edublog accounts? Unfortunately due to misuse by spammers who create blogs to promote products and services we can’t allow the use of embed code on free blogs. Embed code can be used on Edublogs Pro blogs, student blogs attached to a Pro blog via My Class and CampusPress blogs. I think your article is excellent, so useful and informative. Thorough as always Sue. I have touched on Photos in the past, my only concern relates to where it sits within Google. It is not a part of the core suite of apps, therefore if you are to use it with students you should really get signed consent first? Thanks for making this valid point. It’s definitely always a good idea to err on the side of getting consent!